If you want to join in the fun, it is free!!! Love your fabrics and the design. Looks like a very fun project. Your colours are wonderful. I love the zingy green, and it is a lovely contrast with the cute fabric with the black background. 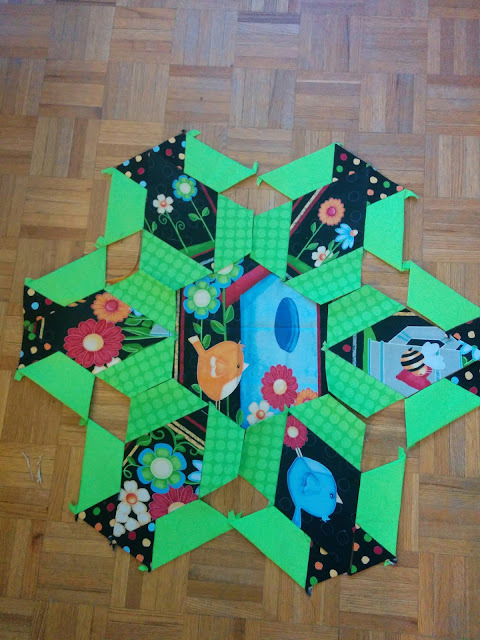 You may be able to help me find a hexagon pattern, I was told it is called Infinity and is a free pattern on the internet, but I can't seem to find it. It has 20,000 1 inch hexagons (it must take an infinity to make it). Very pretty! You have awesome patience! Lovely start! I went to Hillbilly shop to join up.